The good news for Liverpool is that Mario Balotelli has never bitten anyone on a football field. He has thrown darts at youth-team players, paid an impromptu visit to a women’s prison and gatecrashed an Inter Milan press conference while a Manchester City player, but he has never mistaken an opponent for a snack. Because the madness of Mario rarely involves malice. His antics can be amusing and are sometimes stupid but he is not the second Luis Suarez. That is both a compliment and a criticism. Balotelli’s many misdemeanours are not as serious as the former Liverpool striker’s crimes, but nor are his feats as great. Balotelli possesses potential in abundance. Suarez, in between the scandals, has realised his. That is why Barcelona have paid over €90 million for the Uruguayan, whereas AC Milan are willing to sell Liverpool the Italian for less than a quarter of that price. Balotelli has lasted one-and-a-half years at the Rossoneri. He was at Manchester City for two-and-a-half seasons before they tired of waiting for him to mature. Many at the Etihad Stadium were relieved to see him go and City have shed their reputation as the Premier League’s ‘Fight Club’ since Balotelli and his sparring partner and mentor, Roberto Mancini, took their leave. Yet if Liverpool were due a quiet life after Suarez and a controversy-free existence as altogether more predictable characters such as Adam Lallana and Rickie Lambert generated purely positive headlines, Brendan Rodgers, it seems, has decided to take a gamble, as the club met with the player’s agent this week to open negotiations. Managing Suarez clearly hasn’t scarred him. Another enigma is wanted. It says something about Liverpool’s struggle to sign a world-class striker. Theirs has been an exhaustive search and there can be no pretence that Balotelli was their first choice; not when Rodgers categorically ruled out bidding for him three weeks ago. Yet, before anyone brands it an act of desperation, it also reveals the huge self-confidence of Rodgers. Many a manager would not contemplate signing Balotelli. The Northern Irishman clearly believes he can succeed where others have failed. Balotelli presents a test of his man-management and coaching skills. If the risks are high, the rewards could be colossal. Players such as Suarez, Daniel Sturridge and Raheem Sterling have improved exponentially under Rodgers’ tutelage. Balotelli may be more gifted than any. He has a blend of physical and technical ability that is almost unrivalled in the world game. He allies a heavyweight boxer’s build with rare pace – when he chooses to use it – and a talent for ball-striking that enables him to score from long range. Balotelli at his best – as he was in City’s 6-1 win over Manchester United in 2011 or Italy’s Euro 2012 semi-final win over Germany – is an awesome proposition. Tellingly, both performances came for managers, in Mancini and Cesare Prandelli, who then believed in him. Rodgers’ inherent positivity may enable him to convince Balotelli he has faith in him. 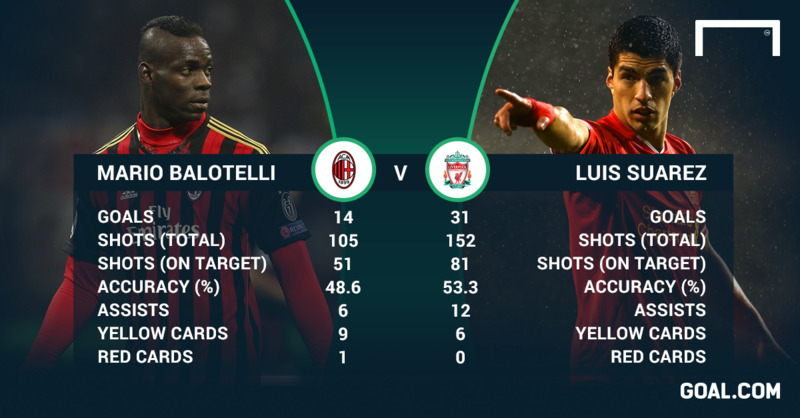 Balotelli’s failings can be exaggerated. He scored a career-best 18 goals last season, no mean feat in a mediocre Milan team, yet he still represents an untapped talent. The consistency Suarez discovered has proved elusive, as much as Balotelli’s concentration still seems to waver. Yet there is one encouraging precedent at Anfield. When Sturridge joined in January 2013, he was warned he was on his last chance at a big club. Balotelli is not quite in the same situation, at 24, but the enfant terrible is no longer an enfant. He is still to justify predictions of greatness. Ensuring the 31-goal Suarez isn’t missed would be a start. Besides easing the burden on Sturridge’s shoulders, he could have a secondary benefit to Liverpool. Tactically, Alexis Sanchez would have been the ideal replacement for the Uruguayan; his ability to play on the wing or as a striker would have suited Rodgers. While Balotelli is better leading the line, his versatility could facilitate similar switches between 4-2-3-1 and 4-3-3. His arrival would bode badly for Lambert; Southampton’s penalty-taker supreme may now find himself losing any training-ground competition with Balotelli, who is clinical from the spot. The danger of bringing in Balotelli is that he destabilises the dressing room. Indeed, he already has. A month after his bathroom was damaged when the misguided decision to set off fireworks was made, he was sent off at Anfield. The door bore the brunt of his frustration, Balotelli removing it from its hinges in anger. “If he damaged the door, he pays,” shrugged Mancini. Despite all the disruption and chaos Balotelli can bring, though, he still has the capacity to be a match-winner at any level. And that’s exactly why Liverpool want to sign him.